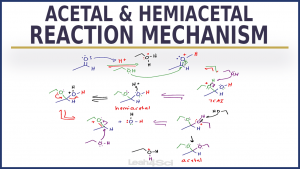 Acetal and Hemiacetal mechanisms can be long, but when you UNDERSTAND each step you’ll be saved from a big headache and trouble from merely memorizing. This video walks you step-by-step through the acid catalyzed acetal formation reaction mechanism! You’ll see special attention on the acetal, hemiacetals, ketals, and hemiketals in the mechanism as well as resonance so you see exactly WHY each step is taking place. You’ll also see the pattern so you can apply this to more mechanisms! This is Video 2 in the Acetal Series. Click HERE for the entire series. Test your understanding with the Acetal Practice Quiz!